A pause in the action in France on September 6, 1918 allowed a photograph of Lt. Col. William J. “Wild Bill” Donovan to be taken. After a distinguished military career before and during World War I, he was later the director of the O.S.S. during World War II, which later became the C.I.A. The editor notes that the article on the Irish “Fighting 69th” of New York in World War I is one of several units from New York profiled in the pages of Military Images. He asks the readers to contribute more articles from the South as well as from the trans-Mississippi in order to produce more balance in the issues. Letters to the editor include praise for the unique content as well as some corrections. A few of the articles remark on questions raised by “Stragglers” from previous issues. 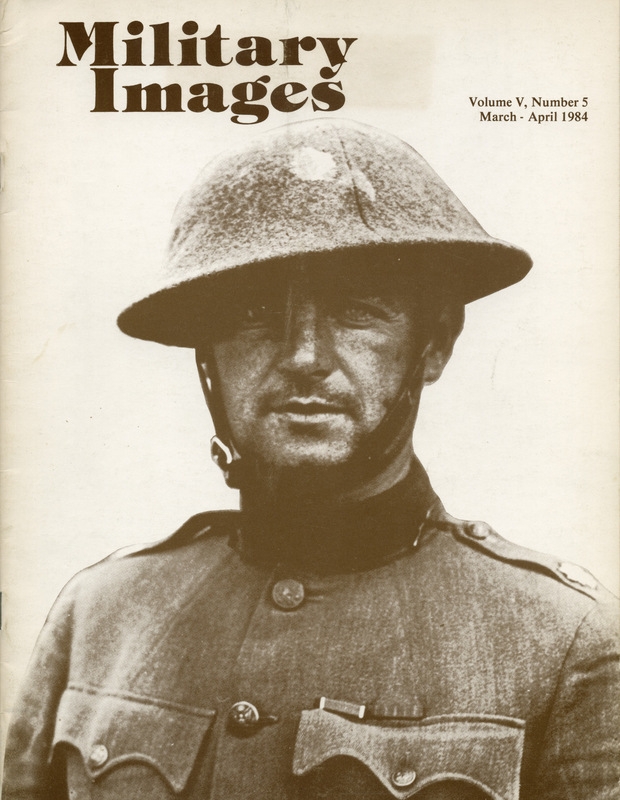 A total of four publications are included in this issue of Military Images. First is The Iron Brigade by Alan T. Nolan, which is a third edition of the 1961 classic publication, including additional images. Second is Even More Confederate Faces by William A. Turner, which continues the work of William Albaugh (Confederate Faces and More Confederate Faces). With improved reproduction photographs of the images, it includes a wide variety of images from the Confederacy, many of them previously unpublished, which allow readers an excellent overview of uniforms, equipment, and period photography. The third publication is Crimea 1854-56: The War with Russia from Contemporary Photographs by Lawrence James. This book documents one of the first wars to be photographed, and provides 85 images, one to a page, each with comments by the author, contemporary commentary, and some with information provided by the photographer. Finally, there is Military Equipage 1851-1872, volume II: State Forces by Frederick P. Todd, the final part of a series begun before the author’s death. With added material by Michael McAfee, the volume provides information on each state and territory, including some of the more obscure units. Eleven different images accompany the article on the two regiments of the U.S.S.S., the United States Sharp Shooters. Known for their green frock coats instead of the usual blue, the Federal sharpshooters had to prove their abilities by getting ten shots into a 10” circle from a distance of 200 feet. They were then accepted into Colonel Hiram Berdan’s two regiments, with the 1st being initially issued green trousers and the 2nd being issued sky blue. The weapons used by these units are also described and shown in the article, beginning with Colt revolving rifles in 1862 until they could be provided with Sharps rifles a few months later. Oftentimes, the units including officers would wear blue sack coats in action, but retained the green uniforms for dress use. The images illustrating the article show the variations in trim, including one that shows a soldier in uniform with gutta percha buttons, which were issued late in the Civil War. A member of Company C, 1st U.S. Sharpshooters, Truman Head enlisted in Berman’s sharpshooters in September 1861. He was 52 years old, originally from New York State, and after spending some years in Philadelphia, Head ended up in California during the Gold Rush. He became a wealthy man by hunting grizzly bears, and became an acquaintance of Edward D. Baker of the 71st Pennsylvania Infantry, known throughout the war as the “California Regiment.” During instruction in Washington, D.C., Joe purchased his own Sharps rifle, which was the rifle the men wanted to be issued. Col. Berman sent an appeal directly to Secretary of War Simon Cameron, sending the appeal with a man with a Sharps; Joe was the only on in either regiment to have one, so it was likely him who went. The U.S.S.S. regiments got their weapon of choice, likely due to Joe’s maturity and his skill with the rifle. Becoming known as “California Joe” about this time, he became known early on for his skills in the field, many of these memorable incidents recounted in the article. Mustered out in 1862 due to his failing health and eyesight, he was given his discharge papers personally by Abraham Lincoln. Returning to San Francisco, “California Joe” passed away in November 1875. An independent unit originally formed as the headquarters guard for General Robert Anderson, commanding the Army of the Ohio, the Anderson Troop remained an independent unit until it was broken up in March 1863. Many of its original officers were reassigned to the 15th Pennsylvania (“Anderson”) Cavalry, and it eventually was known also as “Rosy’s Ponies” while under the command of General William S. Rosecrans. Five images of Anderson Troops soldiers accompany the article. Eight different images accompany this article on the history of Fort Niobrara, located in north-central Nebraska, including one of 2nd Lt. Roger Fitch and 1st Lt. J.D.L. Hartman with Mrs. Hartman, the only two officers on Fort Niobrara in 1899 when Company K of the 1st Cavalry was assigned there for 22 months. It was during this time that the images accompanying the article, likely with a box camera, providing an unique glimpse into life on these small Army posts following the Spanish-American War. The first image in this article illustrates the anecdote with which the article begins: the 69th New York National Guard had such a long and illustrious history that its color-staff was much longer than regulation as it had to accommodate the battle streamers that outlined the regiment’s history. Long before they became the 165th U.S. Infantry Regiment of the 42nd (“Rainbow”) Division, they held a storied past in the Civil War, which was a contributing factor in a brawl over an upturned ice cream truck with the 167th. The 167th had origins in the 4th Alabama (Confederate) Infantry, both having fought at Fredericksburg. The article provides insight into some of the individuals who made up the 69th in France, including Major James McKenna of the “Shamrock” Battalion and noted American poet Sgt. Joyce Kilmer, both of whom were killed at Ourcq River, Father Frances P. Duffy, the chaplain of the 69th, and William “Wild Bill” Donovan, featured on the cover of the issue. Readers are asked to “Find the Foreigners” in this edition of “Stragglers” from a collection of eight different images. The images are identified at the bottom of page 31. Mounted cavalryman Corp. Ralph McCormick, Troop A, 11th U.S. Volunteer Cavalry is featured in this circa 1903 image taken in the Philippines.